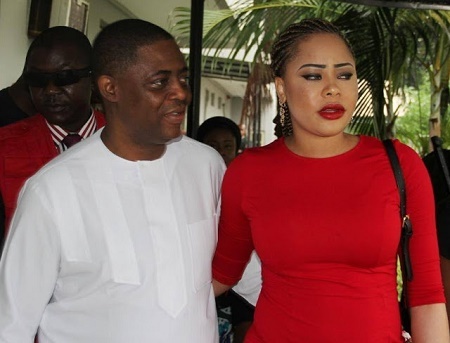 Former Aviation Minister, Femi Fani-Kayode has written a long love poem for his wife, Precious Chikwendu after she was named 'Most Infuential Beauty Queen' in Nigeria. Below is what the PDP chieftain wrote for his beloved wife. My Precious, my soul-mate, my wife, my friend, the mother of my beautiful son Aragorn and the one that brings me joy. The one that gives me strength and offers me hope. The one that stood with me before my accusers and laughed them to scorn. The one that renews my youth, that makes me smile and that expands the horizons of my inner-most thoughts. The African Khaleesi: the Mother of Dragons. The Regent of the Western shores of Westoroth and the Guardian of the Iron Throne. The Elf Queen of Gondor and the Shieldmaiden of Rohan. The Protector of the Shire and the beloved of Aragorn. The one that is cloaked in God’s glory and favor, that wields the razor-sharp two-edged sword and that is known as Queen of the Kingdom and the Daughter of Zion. The one that wears the glistening crown, that bears the ring of power, that is blessed with splendor and honor and that is worthy of adoration and worship. The one that blossoms with the fragrance of a thousand daffodils, a touch of poppy-seed and the scent of Alliage perfume. The one who wines and dines with gods and giants in the halls of Elysium and who dances like Arwen in the fields of Lothlorien. The one that is a special gift from the Ancient of Days, whose blood is royal blue, who wears the purple robe and who carries the mantle of a future Queen. The one that refuses to tremble at the lion’s roar or to quiver before the raging storm. The one that dared satan to do his worse and that, in total faith, took the Lord God of Hosts at His word. The one whose fortitude and courage is simply inexplicable and whose strength of character, firm resolve and iron will is incomprehensible. The one who stood firm like the Rock of Gibraltar when all others fled and fell. The one that harbored no fears and doubts: that walked with titans and that danced with the immortals. The one that is as refreshing and reinvigorating as the morning dew. The one that conjures love with her simple and innocent smile. The one whose noble birth gives her an edge over others. The one whose integrity, character, honor and heritage is unquestionable and unimpeachable and whose loyalty is as constant as the northern star. The one whose beauty surpasses all others and whose noble qualities leaves lesser mortals standing. The one whose purity dispels the darkness, who brings life and hope and who is the beloved of the Lord. My Precious, you are a rare gem though you may not even know it: a rare gem that is encrusted in topaz, sprinkled with diamonds, clothed with emeralds and crowned with the finest gold. You are envied by most yet loved by many: let not your joy be cut short. Let not another take your beautiful crown. Let not your glory and your star be dimmed. Queen: settle not for less and cultivate the firm resolve to make the necessary sacrifices to satisfy your calling. Do not look for the crown for it shall surely look for you and, as it was with Esther, in God’s time, it shall surely find you. Activate your faith and, like the true Queen that you are, remain aloof, shun the crowd, defend the weak, stand up for justice, help the poor, counsel mercy and immerse yourself in righteousness, knowledge, understanding, sobriety and true humility. Clothe yourself with grace and prepare to receive, for the Lord has already given you the land and all the fat and goodness that springs forth from within it. The matter is settled. You need not struggle. Your beauty and purity in body, spirit and soul surpasses all others. You deserve the best. Yours are men of power and learning: men with vision and that are blessed with keen and bright minds. Men that are filled with the Spirit of the Living God and that will bow to none. Yours are Kings and Presidents: men of authority and destiny and not just mediocre mortals who toil to build, nurture and sustain their worldly empires and their ephemeral wealth. You were not crafted for the benefit of traders and merchants but rather to the glory of God and for the joy of the King: the Lord’s beloved. You are a Queen of noble and royal birth and you are graced with a royal mien and a regal disposition. The world can hold nothing back from you because the Lord has already spoken and given it all to you. It is just a matter of time. It is your destiny, your glory, your star, your future, your role and your purpose and it was ordained before the oracles of time. Let not sorrow or sadness take it away from you. Hear not the whispering voice of doubt and fear because, as long as He is with you, you cannot fail. Rebuke the enemy, go forth boldly in the name of the Lord and take what is yours. Don’t let them rob you. Stand on the prophecy, yearn for it, protect it, nurture it and pray for it to come to pass. It is your right, your due, your portion and, most important of all, it is the will of the Living God and He has decreed it. Lose it not, ”for the vision is for an appointed time and, though it may tarry, it shall not fail or prove false”. Royal and noble is your blood, your spirit and your soul. You are excellent in all your ways and your gait is magnificent. So regardless of whatever circumstances you find yourself in, always remember who you are, hold your head up high and let the peace, joy,strength and confidence of the Lord envelop you. Wear that peace morning, day and night. Not the peace of the world which is premised on vanity, deceit, self-adulation and guile. Not that hollow peace which is nurtured and sustained by carnal minds, reprobate thoughts and deviant philosophies but rather that inexplicable, mysterious, deeply profound and divine peace that the bible says ”passeth all understanding” and that comes only from deep intercession, from being hidden in Christ and from regular communion, interaction and fellowship with the Most High God. Take that divine peace and cherish it. Take that confidence, strength and joy and let it fill you to the brim. Take that wealth and the fat of the land to which the Lord will add no sorrow. And take that crown which He has bequethed to you even before the oracles of time. Like Esther, you are royalty and almost divine, though this was hidden from you by the peculiar circumstances of your humble origin and noble birth. You were chosen carefully even before you were conceived in your mother’s womb by He that is the Creator of all things and that is the God of all flesh. Lord and defy the arrows and distractions of the enemy and mere mortals. Let none deter you. Let none overwhelm you. Let none cower you. Let none suppress, intimidate or silence you. Always remember that greatness comes with a heavy price. Yet, whatever that price may be, do not be deterred for the Lord has already given you the land and all the fat that is in it. I urge you to stand firm and take it. Loved deeply by many, you are unstoppable and unbeatable. You are my Precious: my joy, my pride, my strength and my hope. Precious, shine: for the Lord is with you and He has blessed you in more ways than you can possibly imagine. Never forsake or forget your favorite word and battle cry: ”fearless”. This is YOUR word and it is a powerful. It is filled with faith and strength. The Lord will surely honor it in your life. You shall excel and prosper, you shall wear the crown, you shall sit on the iron throne, none shall come between us and I shall always love you. Shine My Precious, shine!